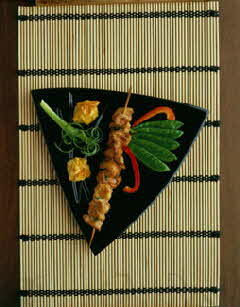 On bamboo skewers, thread pork strips accordion-style with the mandarin oranges. Add a green pepper piece to the ends of each skewer. For sauce, in a small bowl combine the teriyaki sauce, honey, vinegar and garlic powder; mix well. Broil 6 inches from heat 5-6 minutes, turning and brushing with sauce occasionally. These kabobs can be made ahead and kept in the refrigerator until ready to run under the broiler.